Wire that will fit through the holes in the settings. Determine how many stones you want on each cuff. I chose to use 5 for each one. Thread them through the top holes onto a small piece of wire. Fold the edges of the wire up to hold the stones in place. Leave about an inch on each side and trim the excess. Bend the wire so the stones have the shape you want. I wanted them to be in a semi-circle shape to kind of contour the ear. 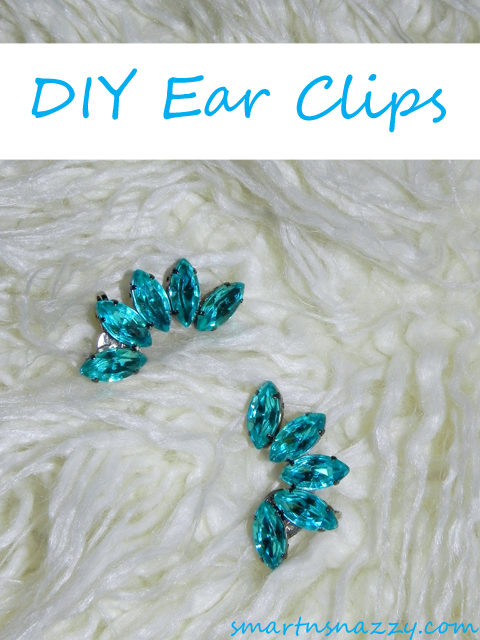 Apply E-6000 glue to the top third of the earrings (where the wire is). Press the stones firmly onto the piece of wax paper, making sure that the glue fills in the gaps and wire area. Let sit for about an hour. When the glue is mostly dry yet still a bit tacky (after an hour is the perfect time), gently peel the paper back and remove your stones. They will stay together now! Trim excess glue and the ends of the wire so it's flush with the stone. Glue the earring blank on to the bottom of the shape, making sure that the joint is out to the side, as shown. If the joint opens downward, the clips will sort of hang down on the top and not stay against your ear. The key here is to have the back open to the side. Let everything dry overnight. These are so fun! I like the statement they make so I opted to style them with minimal makeup but a semi-strong brow and red lip. They really pop and make the look! These are so easy to make, they'd make fantastic gifts for your glam bff, and they're the perfect piece to accent a LBD for the holiday parties! how cool! love that joann's is carrying rhinestones now. and great trick using that wire-- clever! Thanks so much, Erin! I know, finding these at Joann's was amazing! Their selection is pretty slim though, but it's a start! These are perfect and so on point! You have awesome DIYs. Thank you so much Auna! They're super easy to make! So pretty Lia! I love the color too! Thanks so much, Cathy! I do too, it's the perfect teal isn't it?